If you are looking for an ethically produced, beautifully made soft toy then I have just the thing for you. 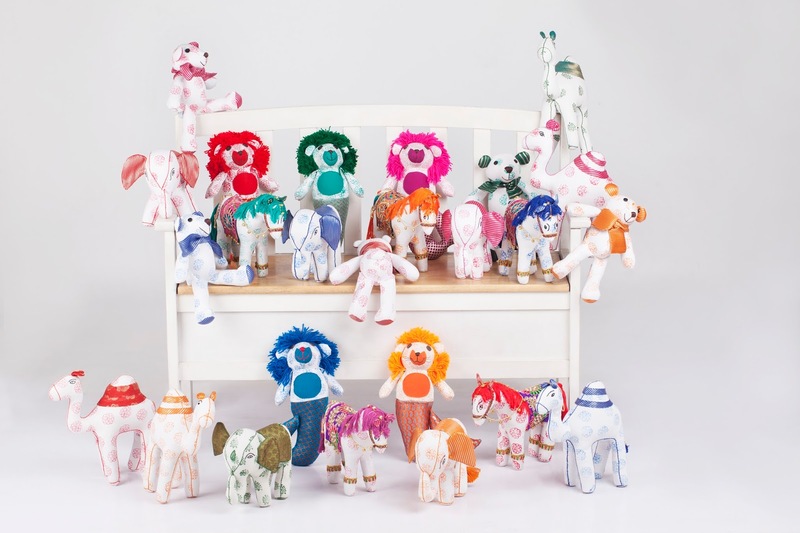 Take a look at these gorgeous toys made by the women of The Sambhali Trust, in Jodhpur, India. The Sambhali Trust is a non-profit charitable organisation based in Jodhpur, whose focus is the development and empowerment of women and girls in Rajasthan. The Trust provides underprivileged Rajasthani women and girls with an education in English, Hindi and Maths, as well as training in vocational and social skills, to support them in developing confidence and self-esteem, and help them work towards financial independence. Since 2007, they have been working with women and children from all communities in Jodhpur and the rural Thar desert area surrounding Setrawa, who experience discrimination on a daily basis because of their low status in class, caste and gender. These women are greatly suppressed due to the patriarchal nature of their society and have little or no access to education. They are denied the right to choose their husband and often face a high level of verbal, physical and sexual abuse within their family circle and community. The Sambhali Boutique, located in the centre of Jodhpur, provides an outlet for the clothes, accessories and handicraft items produced by the women in our Sambhali Graduates’ Sewing Centre, where rigorous quality control procedures ensure that every item produced in the Sewing Centre is made to the highest standard. Their merchandise includes a variety of Indian and Western-style garments, silk and cotton camels and elephants, block-printed scarves and curtains, a selection of shoulder bags, and many other items, each one handmade and unique in their own special way. As the Sambhali Trust is a non-profit organisation, so any profit accrued from the sales of items through the Boutique, after paying for raw materials, wages, and shop overheads, go directly back into the organisation supporting its many projects, helping to make the organisation self-sustainable. You can buy these lovely Fairtrade toys from Postcardshome.co.uk, an online business selling quality home decor and gifts inspired by travel. Their team, based in North London, work with designers and illustrators across the world to breathe new life into traditional design aesthetics and methods and they love to promote products which take them back to their favourite places. I have one main prize of one of the Wedding Horses (above) and three runner up prizes of a Baloo The Bear. Both toys are 30 cm tall so they are sizeable toys. Entry is via the Rafflecopter in the usual way. Terms and conditions apply and UK entrants only. The giveaway ends at 11:59 pm on Friday 24th June 2016. Please note: Sambhali toys are handmade and do not use any hazardous parts or materials. The dyes used are organic and Global Organic Textile Standard certified. The Wedding Horse has detailing that is not safe for younger children to play with. "My Sunday Photo – 05/06/2016"